156 - What Could Possibly Go Wrong? What could possibly go wrong? I think one of the biggest mistakes that we as humans make is that we are far too optimistic about how something we’re planning might go. In doing so we often fool ourselves into believing that it will work as planned, and overlook what could go wrong. In this weeks episode, we’ll discuss how we can take steps to avoid the blind spots that can easily derail us. How many times have you started a project, or tried to start a new habit, only to run into all kinds of unexpected resistance? Maybe you want to start going running each morning or maybe you have a project at work and despite your best-laid plans, things start heading off the rails in ways that you never expected. The optimism and energy you had starts to wane as you deal with one setback after another. I run into this all the time. I think that I have things well planned out only to find that what I thought were conservative estimates and plans were far too optimistic. When we make overly optimistic plans, we act as if it were a simple mathematical formula that we can plug in the right variables and have things turn out exactly as expected. But as we all well know, the best plans don’t mean anything if they can’t stand up to the reality of a situation. We fall into overly optimistic thinking because our brains are trying to be efficient. It takes time and effort to dig into a planning process and go deeper than our initial optimistic plans. It takes exploring uncomfortable thoughts and ideas and being willing to throw away any ideas that don’t stand up to reality, even if we’re very attached to them. So why is it so hard to get things nailed down and complete the things we want? First, we’ll look at two of the most common mental traps that we fall into. Then we’ll look at some ways we can work around own limitations, and help mitigate the challenges that surprise us along the way. We saw this happen in the second Iraq war where, because the decision makers had the idea that there had to be illegal weapons in the country, even the smallest bit of data that could bolster the argument was held up as definitive proof. Anything showing the opposite was simply dismissed and ignored because it didn’t support the idea. Once the country was invaded, it became evident that there were no such weapons and it became clear that the evidence was flimsy at best. Belief Bias is a concept similar to Confirmation Bias. Whereas Confirmation Bias seeks out information to confirm the decision we want, Belief Bias is when we use an existing belief to support a conclusion that lines up with that belief. When we don’t allow our belief to be challenged, and to be open to the idea that we might be wrong, we don’t allow reality to influence our decisions. We may make bad decisions because they are based upon a faulty belief. Circumstances change, discoveries happen, and being open to new evidence is critical to making progress in ourselves, as well as successfully completing projects that we embark on. For example, if we believe that women are not as smart as men, then we may dismiss a great idea because we believe that only good ideas can come from men. I’ve heard from a few women about how their ideas were dismissed at work, simply because they were a woman. Once the same idea was presented by a male colleague, it would be given the consideration it deserved. Because of this belief, it’s taken centuries for women to be treated as equals, to be paid the same as men, to be able to vote. As we progress as a society we often ask ourselves how could we ever have held such a ridiculous belief? So how do we avoid these traps? What are some steps that we can take to be sure that we aren’t fooling ourselves? One of the most important areas of making better decisions is to be open to criticism. One are where we can see that thrives on criticism is the are of science. One of the reasons why we have made so much scientific progress over the last 100 years is because science is open to the idea that a discovery or an idea is only valid for now. That it is based upon the best evidence available and should only stand as long as withstands review and stands up to criticism. We should take this same idea and apply it in our own lives. We should only hold onto an idea or a habit as long as it serves us and helps moves us the direction we want to go. When we seek out contradictory opinions, we are taking steps to counter our own bias. When we come upon new information or receive criticism, we should be willing to review it and change direction if need be. One of the things that sets us apart from other animals is our imagination. The ability to tell ourselves fictional stories, to think about what-if scenarios is a powerful tool in creating our future. Without imagination, we would not have the ability to create ideas about what we think the future will be like. We would have no way to plan for the future. This singular ability is what helps us to move from being reactionary beings to creators and designers of our future. But far too often we suffer from a failure of imagination and end up surprised that things don’t turn out as we expect. Because we have the gift of imagination we need to consider the unlikely, to think of the impossible, and be open to ideas that we may not like. This also opens us to a larger pool of possible solutions. “Nothing happens to the wise man contrary to his expectations. 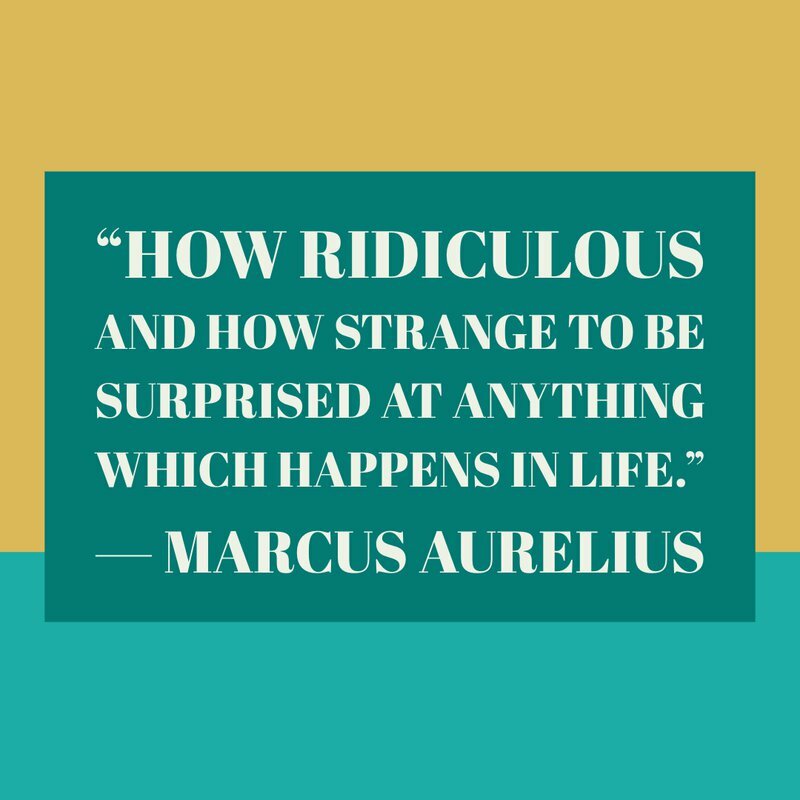 One of the most important practices that the Stoics have is Premeditatio Malorum, which is to imagine all that possible ways that things could go wrong. I’ve talked about it before on the podcast, and it’s a very useful practice. This is not the same thing as being pessimistic. I like to think of it as a way to test your ideas and plans against reality, by using your imagination. This is not an easy exercise. It takes effort to let go of your wish to have the right solution and to think of all the things that could go wrong. I came across a similar exercise that psychologist Gary Klein calls a “premortem”, that illustrates this idea rather nicely. As Dr. Klein explains, “Our exercise, is to ask planners to imagine that it is months into the future and that their plan has been carried out. And it has failed. That is all they know; they have to explain why they think it failed.” Just as doctors do a postmortem to understand what happened after the fact, a premortem is a way to truly imagine the most likely ways that a plan could fail. A lot of the topics I’ve discussed today revolve around the fact that we don’t like to be wrong. We get attached to an idea and want that idea to be right, and thereby validating ourselves. But the thing is the more try to avoid failure, rather than facing it head on, the more failure we’re going to have. Being able to let go of needing to be right, of validating ourselves, the more we can get out of our own way and make better decisions. Hey friends, thanks for listening to the podcast. If you like what you hear, I would really appreciate it if you could help support me by making a pledge on Patreon. You can find me at patreon.com/stoiccoffee. Even just a small amount helps in keeping this podcast going. Also, head on over to my website at www.stoic.coffee and sign up for our weekly newsletter. And lastly, if you know of someone that might like or could benefit from this podcast, please share it with them. Word of mouth is one of the best ways to help this podcast grow. Thanks again for listening.